Selena Thinking Out Loud - Products Review Discounts Giveaways: 4th of July $500 Cash Giveaway Announced by SVB Productions! 4th of July $500 Cash Giveaway Announced by SVB Productions! 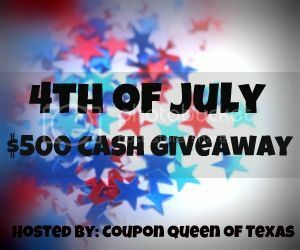 Selena Virginia Brown Productions has announced a 4th of July $500 Cash Giveaway hosted by Coupon Queen of Texas. Visit Selena Virginia Brown Productions to enter the giveaway! This event ends: 7/4/12, 11:59pm/EST.